Our objects of study are finite state transducers and their power for transforming infinite words. Infinite sequences of symbols are of paramount importance in a wide range of fields, from formal languages to pure mathematics and physics. While finite automata for recognising and transforming languages are well-understood, very little is known about the power of automata to transform infinite words. 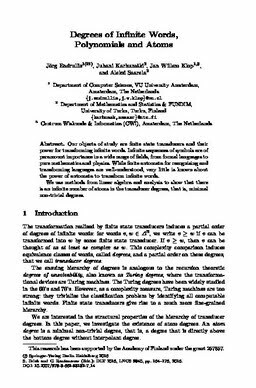 We use methods from linear algebra and analysis to show that there is an infinite number of atoms in the transducer degrees, that is, minimal non-trivial degrees.